There are LOTS of activities available including outdoor recreation, museums, attractions, shopping and eateries to experience. All within easy driving distant of Fish Creek. 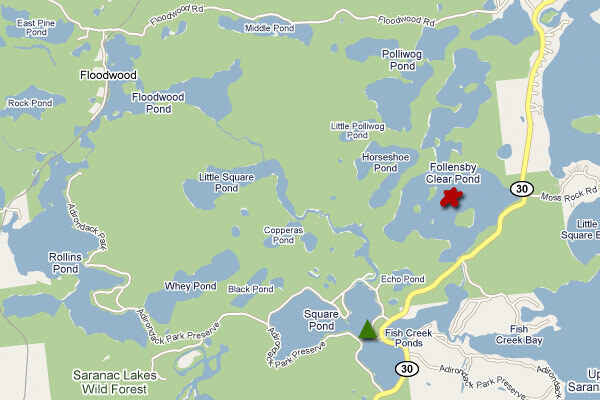 Paddle right from your site up Fish Creek to Little Square Pond. Additional ponds accessible via short portages. Paddle up Follensby Clear Pond for peace, quiet and tranquility. 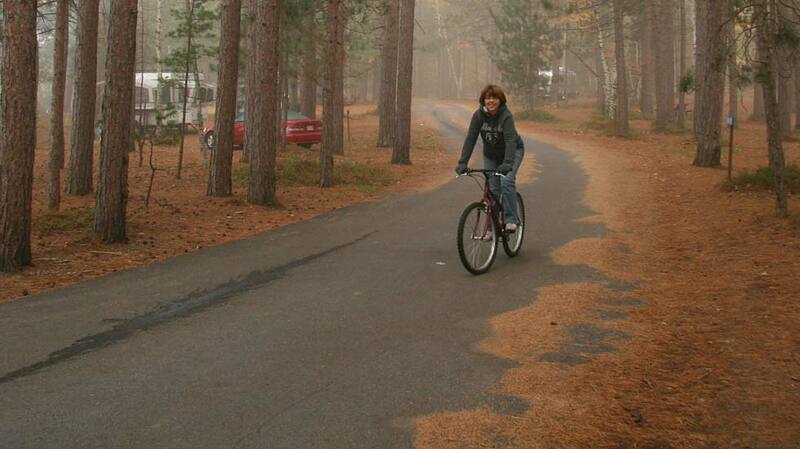 Biking is one of the most popular activities at Fish Creek. 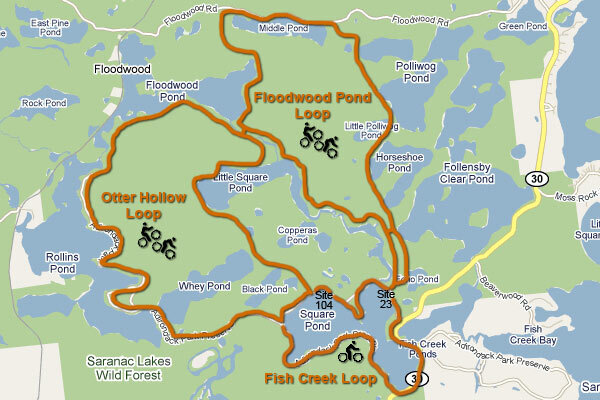 The main bike route is the main park road that follows the shoreline around all three ponds in the campground from the park entrance to the far gate on Route 30. This road is paved and is very level. There is also a paved path that connects the park entrance to the far gate, thus allowing bikers to do a complete loop around the park, all on a flat paved route. The total distance around the park is 4.7 miles including the peninsula and 4.3 miles via the peninsula bypass. .6 miles of the route follows the paved path adjacent to Route 30. The total distance around the park is 7.6 km including the peninsula and 7 km via the peninsula bypass. 1km of the route follows the paved path adjacent to Route 30. Parents should supervise younger children along this route as there can be significant road traffic during the busy summer months. 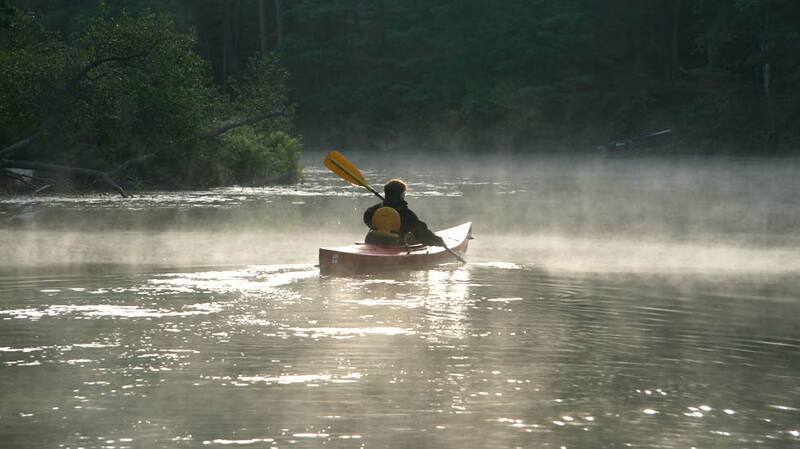 Bring your boat, moor it at your site, explore the ponds and the spectacular Upper Saranac Lake. The 3 ponds at Fish Creek bustle with boating activity throughout the summer. 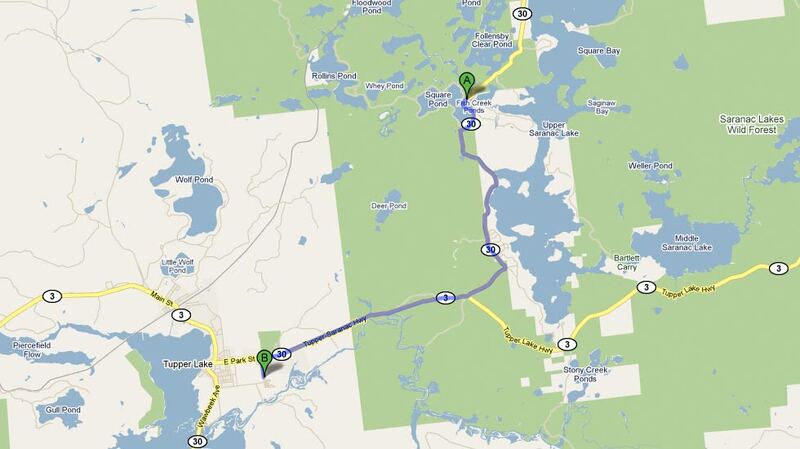 For those looking for larger waters, head up into Upper Saranac directly from Fish Creek. 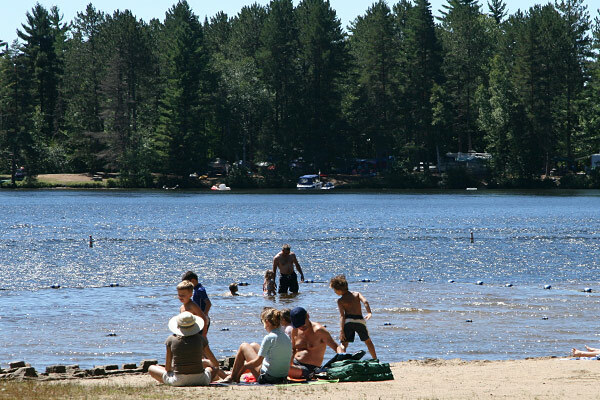 Swimming is available at the park beach, located on the South Pond. Located just up the road to the left as you pass the main entrance gate. The beach is open from the end of June until Labour Day. Swimming is allowed at the beach during designated hours when a lifeguard is on duty. There are days when lifeguards are unavailable, and for the safety of the campers, the beach will not be open and swimming will be prohibited. Although swimming is not officially permitted elsewhere, many campers do swim off the shores of their own campsites. It is important to note that there is considerable boat traffic on the ponds, and anyone including pets should keep close to the shore for their safety. Do keep aware of boating traffic in the area! 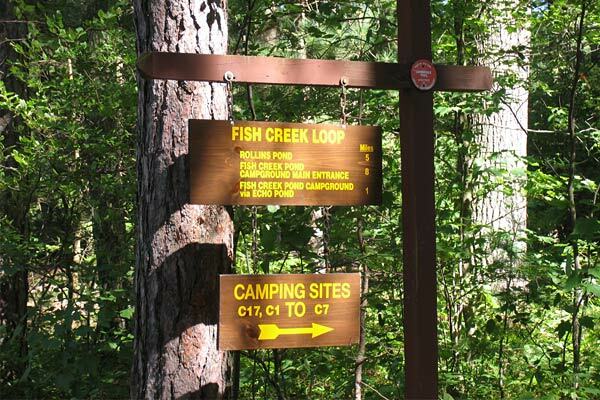 There are two main hiking trails that originate within the campground. 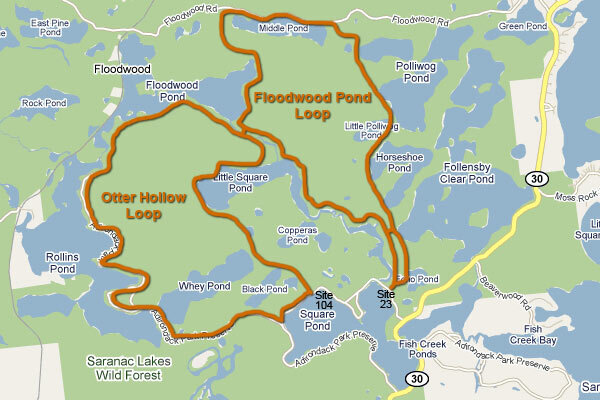 The first is the Floodwood Pond Loop which starts across from around site 12, passes Echo Pond, heads up between Horseshoe Pond and Little Polliwog Pond, around Middle Pond, back along Floodwood Pond and then follows Fish Creek back to the campground at site 23, via the road into C section (sites C17 and C1-C7). This trail is relatively flat with some ascents and descents. Total length is 7.7 miles. 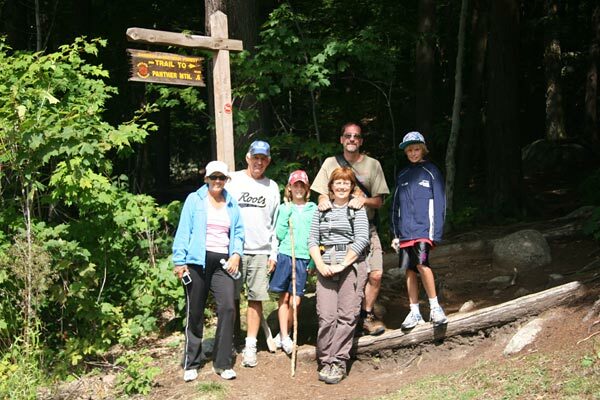 Panther Mountain is an excellent choice for a close by, shorter hike with the kids. It has a total vertical gain of only 400 ft, yet offers fine mountain views and Tupper Lake in the distance to the south west, and Ampersand Mountain to the east. 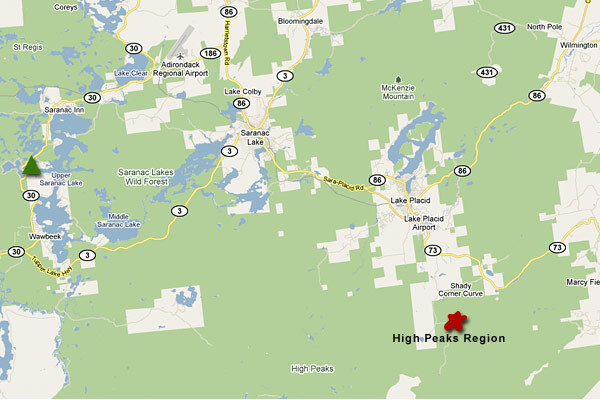 Also visible are Middle Saranac and Stoney Creek Ponds. Its about a 15 minute hike to the partially open summit.Panther Mountain is located 6.6 miles south of the park, a short 10 minute drive. Take Route 30 south, then head east (left) on Route 3. 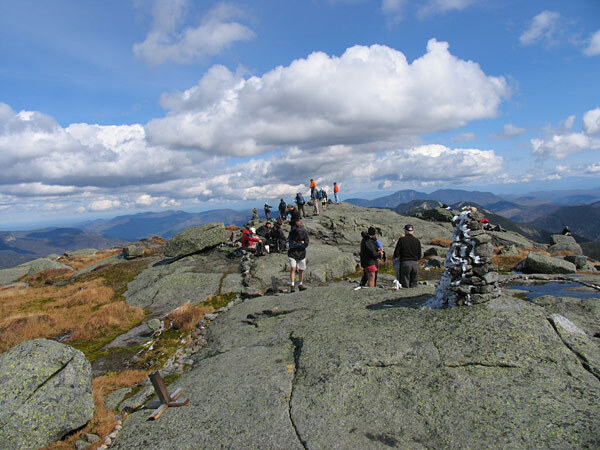 There are a great number of excellent hikes in the nearby high peaks region east of Lake Placid. The high peaks are approximately 1 hour south east of Fish Creek. 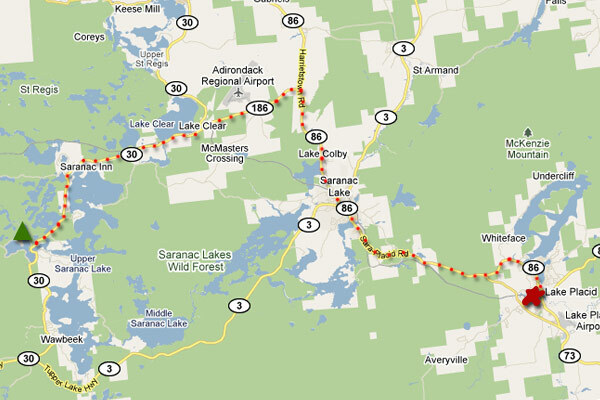 Head south on Route 30, then east on Route 3 to Saranac Lake, Route 86 to Lake Placid and Route 73 to the high peaks area. Golfing is available, just up the road at the Saranac Inn Golf and Country Club. The Saranac Inn Golf and Country Club is open to the public. Founded at the turn of the century and designed by renowned Scottish Pro and Architect Seymour Dunn. The course was designed using the natural terrain to provide a wonderful golfing experience, with spectacular mountain views, pure mountain air and a memorable fragrance emanating form the balsams that line the course. Fully irrigated with bent grass greens, the course has a reputation as one of most carefully maintained and challenging resort courses in the Northeast. By not overlooking any details, Jim Connors and Steve Wilson have continued a tradition of offering a course that is par-excellent. In fact, one can almost practice putt on the bent grass tees. These high standards result from an understanding of what today's golfers are looking for with a motel overlooking the first tee, restaurant and lounge. The Saranac Inn Golf and Country Club was awarded 2006 Golf Digest Best Places to Play. 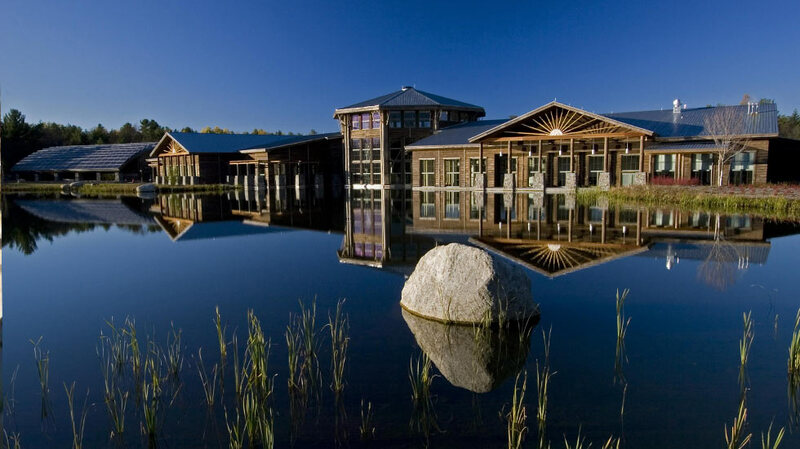 The Wild Center is a new natural history museum located in Tupper Lake. 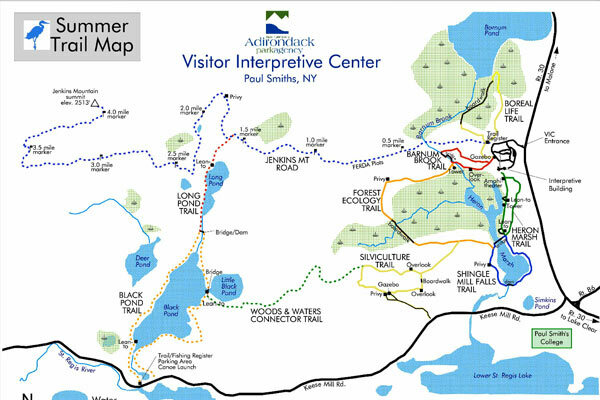 The Paul Smith VIC introduces visitors to the special features of the Adirondack Park. The VIC helps orient visitors to the park via educational programs, exhibits, and interpretive trails. There are approximately six miles of interpretive trails and eight miles of backcountry trails to explore. Dedicated to preserving and educating visitors of the history of the Adirondacks. Called "the best of its kind in the world," by The New York Times, the Adirondack Museum at Blue Mountain Lake overlooks the lake of the same name. There are 20 buildings on 32 acres of grounds and gardens, house exhibits on logging, boats and boating, mining, outdoor recreation, transportation, rustic furniture., and on-going programs and special events offer a variety of interesting activities. 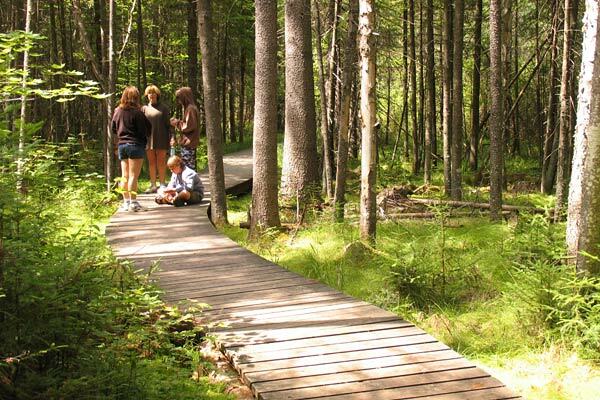 Tour great Camp Sagamore, a National Historic Landmark in the heart of the Adirondacks. The Sagamore consists of 27 authentic buildings that were part of the wilderness estate of the Vanderbilt Family from 1901-1954. 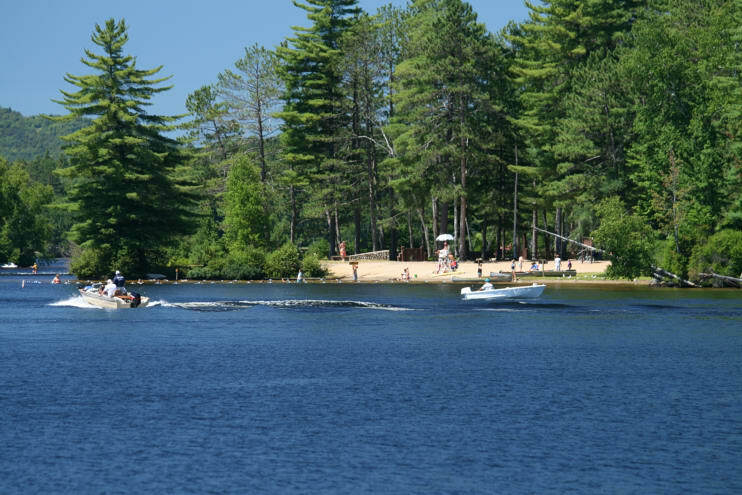 Tour many of the buildings, and the grounds onlong the shores of Raquette Lake.The camp is dedicated to the enjoyment of education, interpretation & historic preservation, Great Camp Sagamore is not a hotel, it is a bit of history. Check out the three Olympic jumps that are equipped for summer flight. Surfaces made of half-cut porcelain marbles and plastic shingles, which we water to simulate snow, allow jumpers to practice and compete year-round. For the freestyle athletes, their landing is a bit wetter in the summer, as they complete their routines by splashing into a 750,000 gallon pool. Stand at the base of the jumps and watch the athletes—some among the best in the world, others just getting a feel for the sport—tuck down the launch ramp, burst into the air and, seemingly, hang there, suspended, before sticking the landing. Nearby, aerialists will spring off steep kickers on the freestyle hill in a flurry of twists, turns and tumbles. Wet 'n Wild Wednesdays and Soaring Saturdays are their weekly chance to show off for you. Designed to appeal to the whole family, these performances will give you an inside look at how these amazing athletes pull off all those tricks. For a different perspective, ride the chairlift up to the base of the jumps. From there, take the elevator to the observation deck at the top of the K-120 meter jump. Then look down and remind your heart to start beating again. The K-90 and K-120 meter towers have been in use for more than a quarter-century, but Lake Placid's jumping tradition reaches back to the 1920s. It wasn't long after the Wright brothers took off in North Carolina that the people of Lake Placid began experimenting with flight themselves. Except, they left out the wings and propellers. Home of the combined bobsled, luge and skeleton track, the only one east of the Rockies. Take a trip down the Lake Placid Bobsled run! If you've ever wondered what it feels like to be a comet, this is the place to start. In summer, when bobsleds trade blades for wheels, climb into a sled with a professional driver and brakeman, and shoot down the 1980 track known, and respected, by racers the world over. With the sun on your back, you'll feel the rumble through one turn, bank high on the next one and pick up speed on the straightaway. You'll go faster than you're allowed to drive a car through town. Then you'll get to the bottom and want to do it again. For your bravery, you'll get a bobsled lapel pin, a 4x6 commemorative team photo, t-shirt, a Lake Placid Bobsled Experience sticker, membership in the U.S. Bobsled and Skeleton Federation and 20 percent off your second bobsled ride. Take a ride up the highest vertical drop in the east to an elevation of 3,676 ft. The eight-person Cloudsplitter Gondola carries you and your family, or anyone you think might enjoy a picnic lunch among breathtaking views, from the Main Base Lodge to the top of Little Whiteface. As you trace the mountain's contours, soaring over streams, steep rock faces and thick forests, the beauty of the Adirondacks reveals itself. You'll see Lake Placid and its namesake village. To the east lies Lake Champlain. To the south stand the tallest peaks in New York State. You'll spot the ski jumps and the Ausable River. At the top, an observation deck and picnic area await you. These are some of the country's best views, and this is the best way to see them. 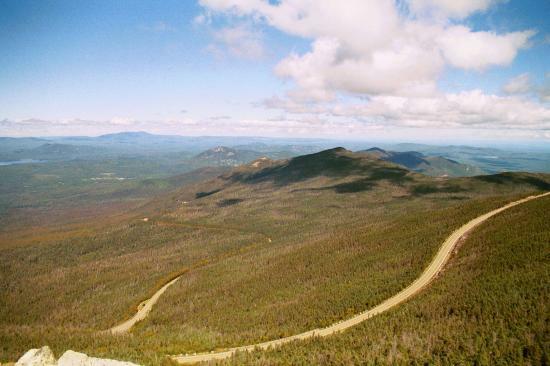 Take a drive to the top of 4,867 foot high Whiteface Mountain. Driving to the top of New York's fifth-highest peak isn't your typical automotive experience. How many other roads do you know that lead you directly to the best seat in the house—the house being the Adirondack Park and the show being gorgeous views spanning hundreds of square miles of wild land reaching out to Vermont and Canada? Nowhere else is the beauty and vastness of the Adirondack Park so apparent and so easily accessible. The paved road rises over 2,300 feet in five miles from the Toll House. At the summit, a few things you don't often find atop a peak: a castle built from native stone, a restaurant and gift shop, an elevator carved deep inside the mountain top itself and a truly spectacular 360-degree, panoramic view of unparalleled beauty. A visit to the Adirondacks is not complete without a drive to the top. In the shadow of Whiteface Mountain, you can take a nature walk to view the Ausable River as it spills over ancient granite cliffs. High Falls Gorge is a popular area destination, featuring a spectacular 700-foot waterfall with ancient granite cliffs more than a billion years old. 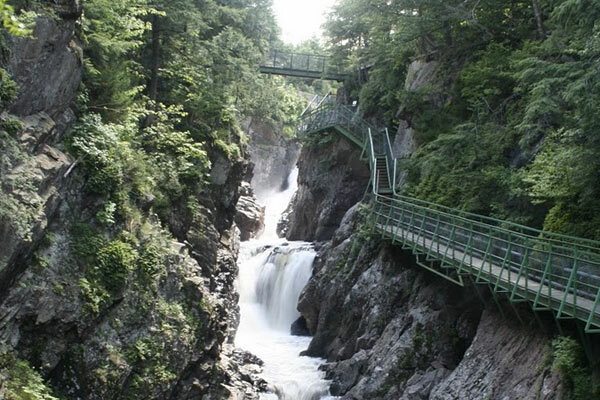 It was created as the Ausable River cut through the granite base of Whiteface Mountain. You can take a self guided walk over sturdy bridges, walkways and groomed paths providing safe access to breathtaking views and photographic vantage points. 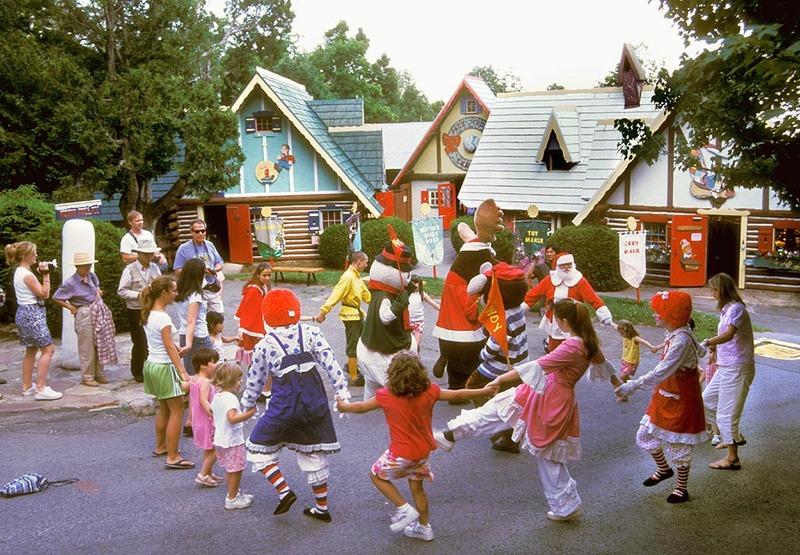 The magic of Christmas comes alive again when you visit with Santa Claus at his home and workshop. 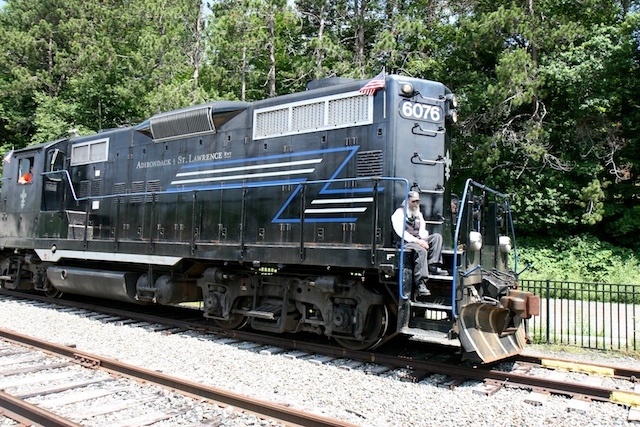 Ride the scenic railway between Saranac Lake and Lake Placid. Riding in a climate controlled coach, or take in the fresh, clean air in our open car, through remote forests, past sparkling rivers, over bridges, tranquil ponds and streams, into the magnificent beauty of the six million acre Adirondack Park. Become a witness of nature's beauty and look out for the many animals and birds along the routes. 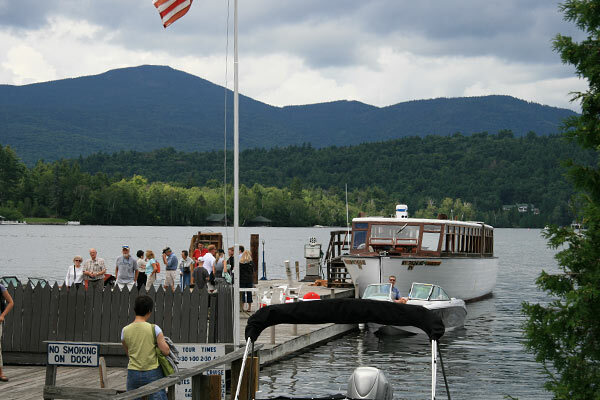 Take a scenic tour out on the pristine waters of Lake Placid. This hour long, 16 mile narrated cruise takes you along crystal waters in the comfort of an enclosed, turn of the century boat. 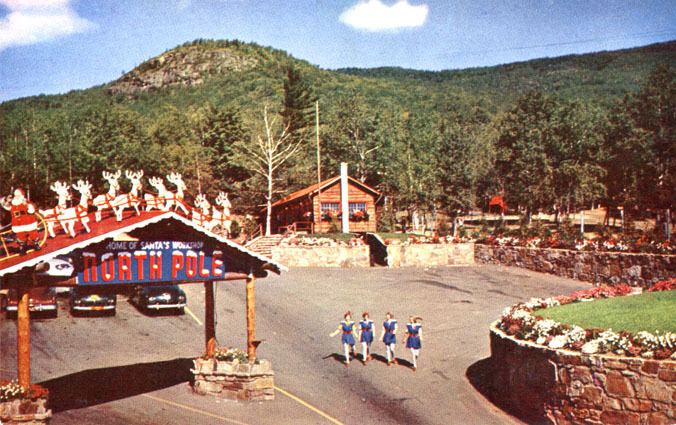 Learn about the wildlife and historic manors on the Lake Placid shore and also Whiteface Mountain, site of the 1980 Winter Olympic Games. Enclosed boats make for a delightful experience rain or shine. 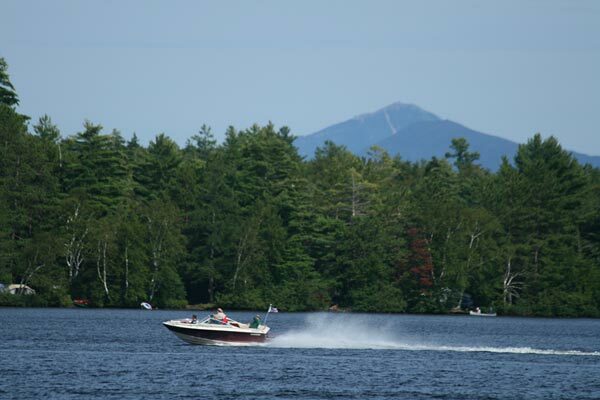 Enjoy a scenic cruise of Raquette Lake. Options include dinner cruises moonlight cruise with live entertainment, Sunday champagne brunch cruise, luncheon buffer curise and even a pizza cruise! Be sure to visit the Olympic Village, surrounded by tail, majestic mountains. 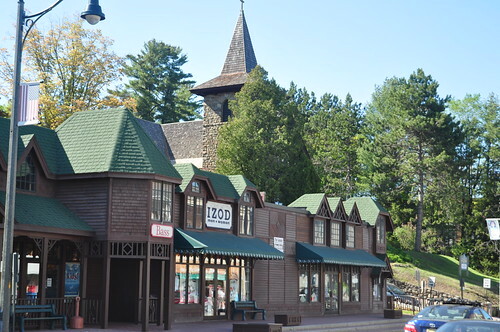 A perfect place to tour the many shops, including olympic souvenirs and clothing, adirondack furniture, outlet stores, antique shops, and gift stores. Or take a scenic walk around Mirror Lake. Lake Clear is home to Hohmeyers Lake Clear Lodge which offers unique lodging and dining. Enjoy the Adirondack's only lobster-bbq family restuarant. Features an outdoor BBQ, clam-bake, lobster, corn on the cob, live music etc. Great place to eat outdoors. Does get mixed reviews, but the atmosphere makes up for any shortcomings! 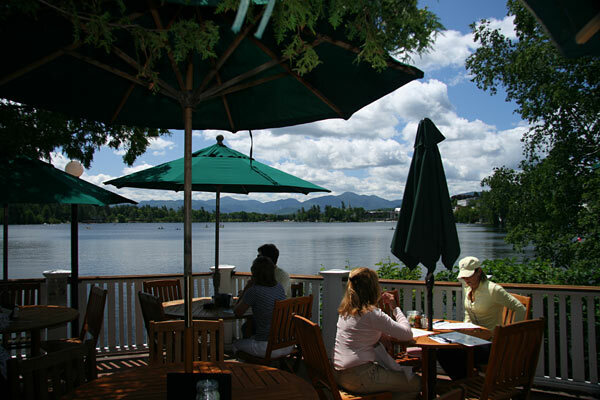 The place to head for lunch or apres shopping while visiting Lake Placid. 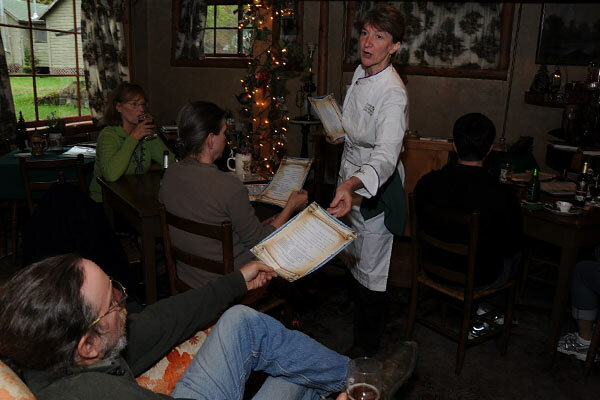 With unique twists on pub-style favorites, special health-conscious dishes and a children's menu, the Cottage's bill of fare has something for everyone. And its wide selection of international beers, wines and liquors make the Cottage a perfect place to unwind with your favorite cocktail. The Cottage is the place to meet in Lake Placid.